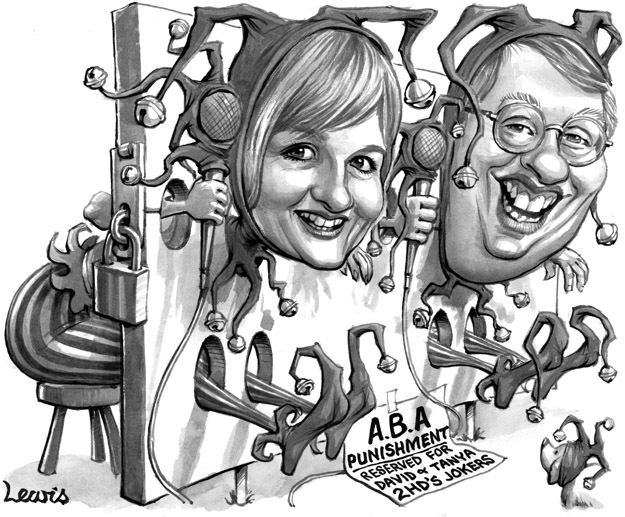 David and Tanya, a leading Newcastle breakfast radio team, are punished for breaching Australian Broadcasting Association rules in the late 1990s. In a radio interview the day this appeared in the paper David complained bitterly that I made him look too fat. This entry was posted in Editorial Portraits and tagged breakfast radio, celebrities, compere, david, entertainment, radio, radio jocks, tanya on November 23, 2012 by Art by Peter Lewis.